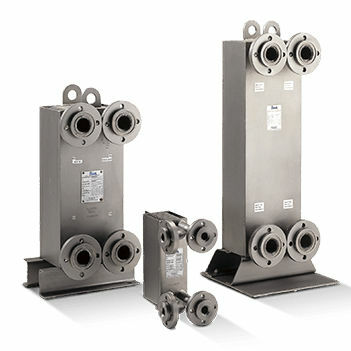 Our line of Schmidt SIGMAWIG all-welded plate heat exchangers represents the most compact, rugged and cost-effective means of transferring heat in many industrial applications. Built entirely without gaskets or with an O-ring type gasket between the all-welded plate pack and frame, they provide exceptional corrosion resistance. The exchanger features corrugated plates that produce highly turbulent flow in a true counter-current direction. The result is high efficiency in a very compact design. Due to the smaller size and reduced material content, welded plate heat exchangers can be the most economical heat transfer choice.